Jon Michelet was a journalist, newspaper editor, local politican, labour activist, TV anchor and, most of all, a best-selling author who won lots of awards. Many Norwegians were thus mourning his death from cancer during the weeknd, but heartened that he’d managed to keep writing to the bitter end. That meant that he also managed to finish the last book in a wildly popular series that finally revealed in great historical detail the huge contribution and sacrifices made by Norway’s merchant seafarers during World War II. Called krigsseilere, their bravery was not only largely overlooked but they were also exploited by shipowners and the government in exile at the time. Many died without ever being rewarded monetarily or otherwise for their efforts during the war. 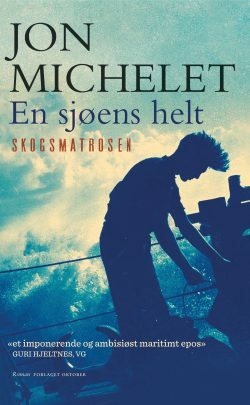 Michelet’s first book on the saga of a fictional young man who went to sea just before the Nazi German invasion in April 1940 became an instant bestseller when it was released in 2012. 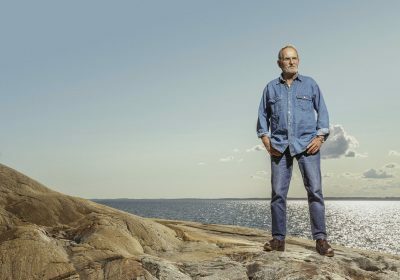 The entire series called En sjøens helt (roughly translated: A hero of the sea) grew to six books that had sold more than 750,000 copies as of last summer. That’s huge in a country of just over 5 million people. The series is also due to become both a TV drama series and a play to be staged in Oslo. Michelet, who was 73, had made no secret of the sad fact that he was struggling with throat cancer. The sixth book was supposed to be finished in time for last fall’s seasonal literary release in Norway, but it had to be postponed while Michelet underwent treatment. The series topped what already had been a brilliant career for Michelet, who also scored major success with another book Orions Belte, a thriller set on Svalbard that became a full-length film released internationally. He also wrote crime novels, biographies and non-fiction on everything from the football World Cup to politics. Michelet had been a seafarer himself, became the editor of newspaper Klassekampen and was well-known for his radical left-wing politics. One of his books, Mappa mi, was a personal account of the illegal surveillance carried out against suspected communists and radicals during the Cold War. He won many prizes over the years, including the Riverton prize for crime-writing twice and Anders Jahres kulturpris, set up with funding from the estate of the late shipowner Anders Jahre. He was married to author Toril Brekke and had two daughters including Marte Michelet, who became a prize-winning author herself. “Damn, pappa, this is tough, this is really tough now,” she wrote in her own tribute to him, published on Sunday afternoon. She wrote of how he’d had serious heart problems a year after his 60th birthday in 2004 and became withdrawn, “scared,” she wrote, preferring to spend most of his time at the family home in the coastal town of Larkollen south of Oslo. “We were worried and thought for a while we had lost him,” Marte Michelet wrote. In 2011, however, “something happened,” whether it was the birth of her first child or the terrorist attack on the Labour Party she’s not sure, but “he sat himself down and wrote what he’d always wanted to write,” about the sea and the saga of Norway’s seafarers during World War II, and what happened to them after the war. “He wrote it for himself, and the dizzying success of it was entirely unexpected for him,” she wrote. Many other tributes were pouring in on Sunday after Michelet died late Saturday night at home in Larkollen with his family around him. “He was deeply loved, and he will be deeply missed,” stated his wife Toril Brekke on behalf of the family.